All photographs in this gallery were made in 2005. Peach trees grew around natural springs in the area and prompted the name given by the Santa Fe Railroad for a steam locomotive watering stop. 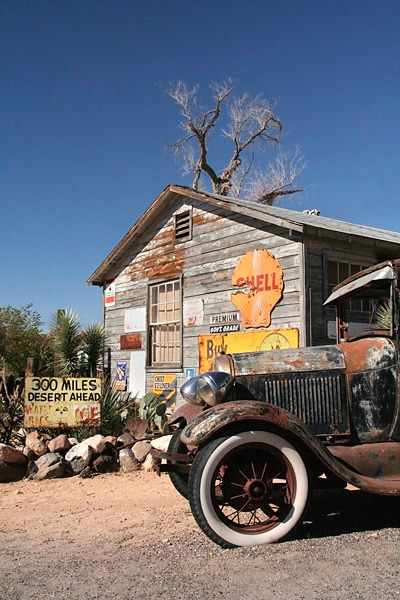 The once busy Route 66 settlement is now forlorn but not completely deserted. 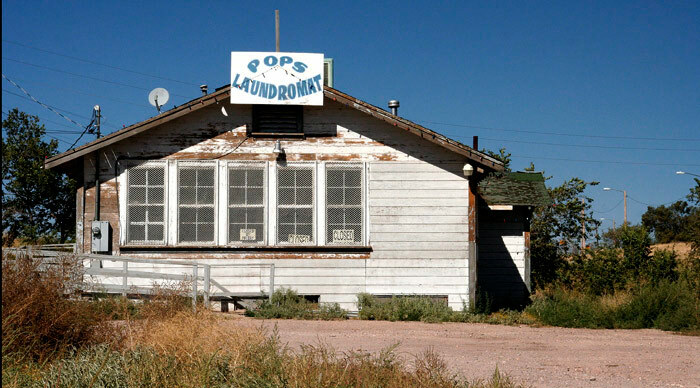 The Hualapai Tribal Reservation headquarters are nearby. 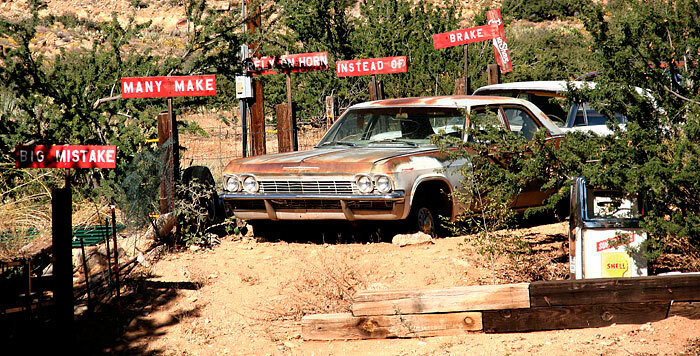 Abandoned cars and other vehicles sit quietly amongst the strips of decaying buildings that flanked Route 66 cutting through Truxton. 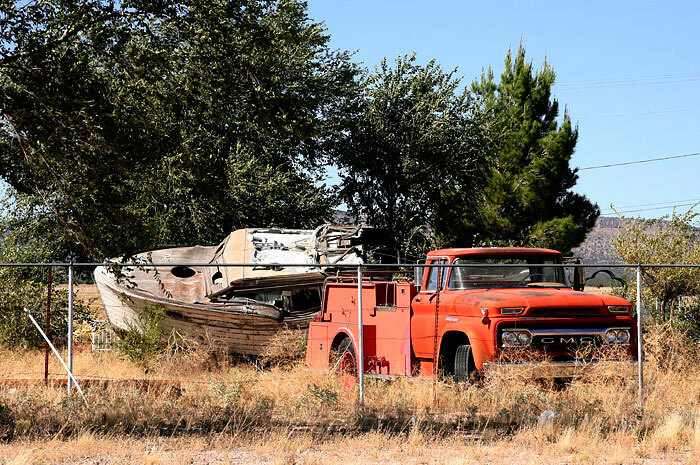 A fire tender and cruiser share a small plot behind framework that perhaps once supported metal mesh. 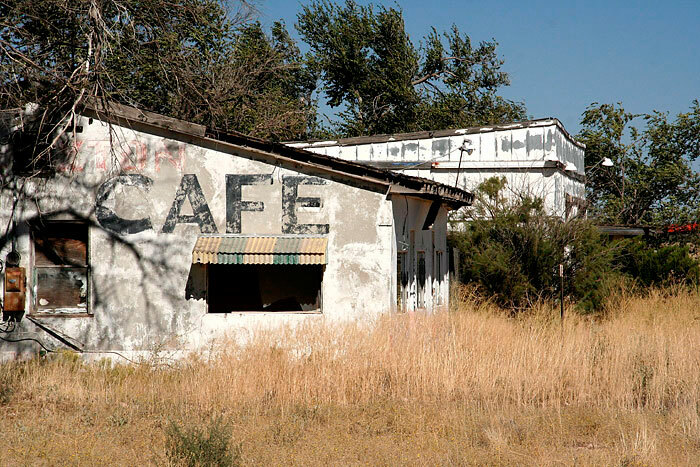 This decaying pair may be the 1951 café and service station that established Truxton on Route 66. 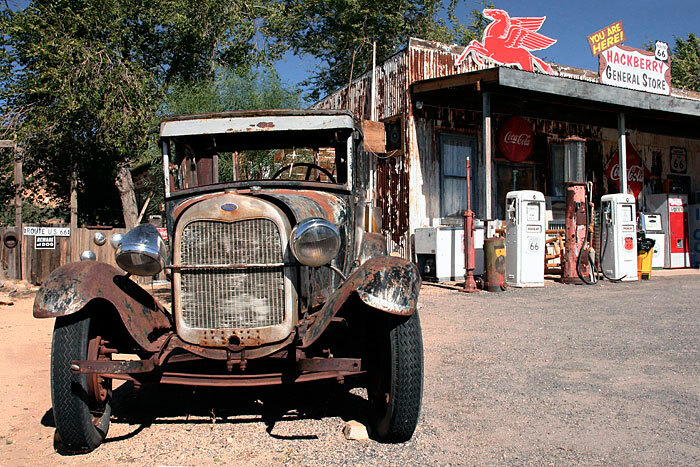 Effectively a ghost town, deserted buildings flank the road, with the Truxton Service Station and Frontier Motel the only working survivors. The dry western Arizona climate does delay the inevitable decay and collapse. In its best years this once trim white café must have been a welcome sight for a family stopping for gas at the garage next door. There may well be one or two cars from that time rusting nearby. 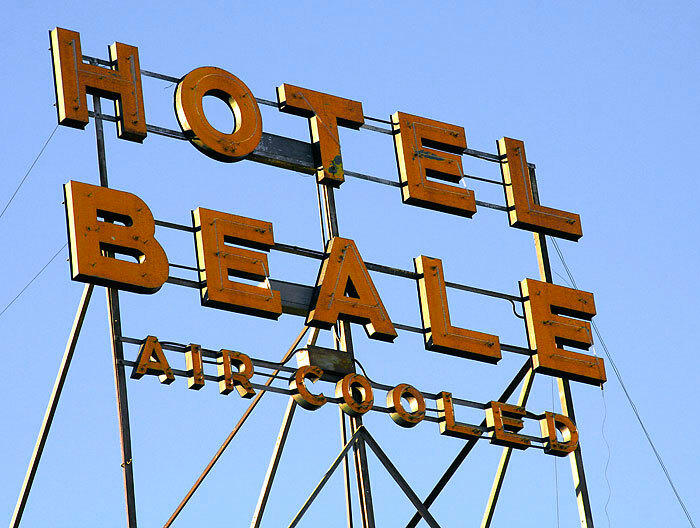 On the west face, the underlying and faded blue lettering advertises the 'LAZY Z MOTEL Electric Heat', whilst the white proclaims the 'BARKER APARTMENTS'. 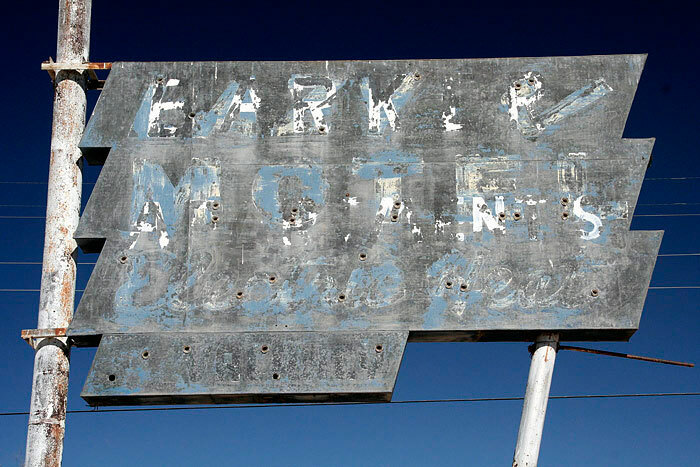 The more lightly weathered white lettering on the east face reads as 'BARKER APAPMENTS' and the blue not at all. Valentine is virtually deserted, and the 'Chief's Motel' buildings have been replaced by small contemporary structures with wall posters advertising 'Bert's Country Dancing Bar'. The brick-built 'Indian School', open 1901 to 1937, decays nearby. Hackberry Silver mine opened in the Peacock Mountains in 1874. It was named after the Hackberry tree that grew by a spring near the mine. By closure in 1919 it had produced $3m of silver and gold. 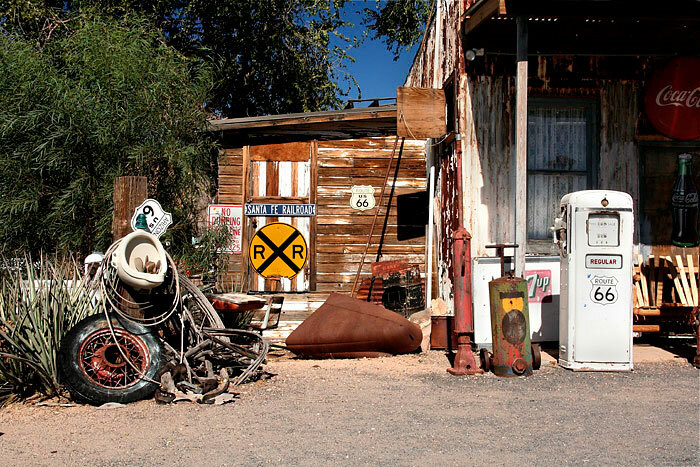 The General Store stands by Route 66, across the Santa Fe Railroad tracks from the town's remains. The arrival of the railroad in 1882 opened up a trade in cattle through Hackberry, combining with mining to support the local economy. 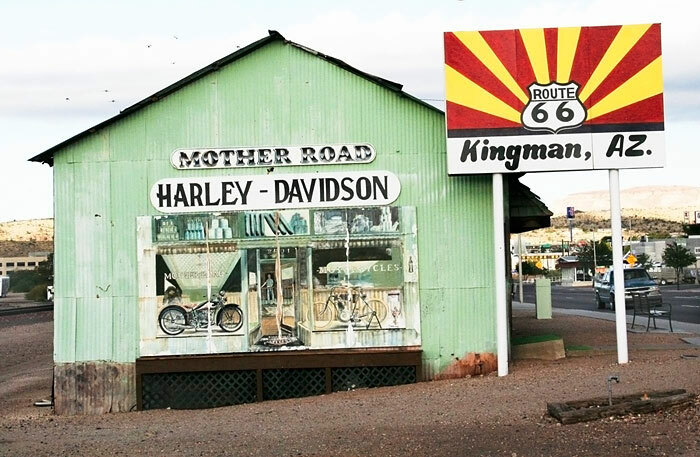 Both declined but the building of Route 66 brought tourism to sustain the town for a while. 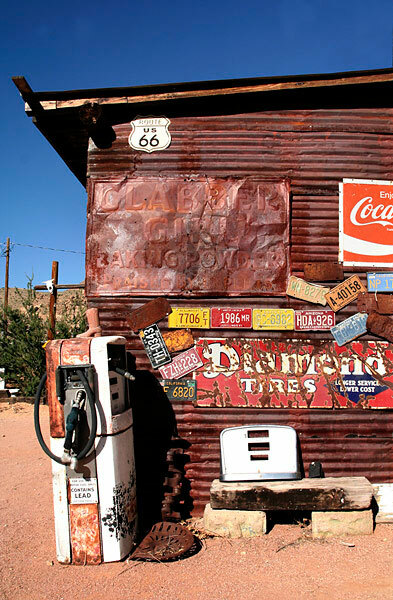 The General Store eventually closed but was reopened in the early nineties by artist Bob Waldmire who established a collection of Route 66 memorabilia. Successors have maintained and augmented his finds. Red-rust cars flank the entranceway. 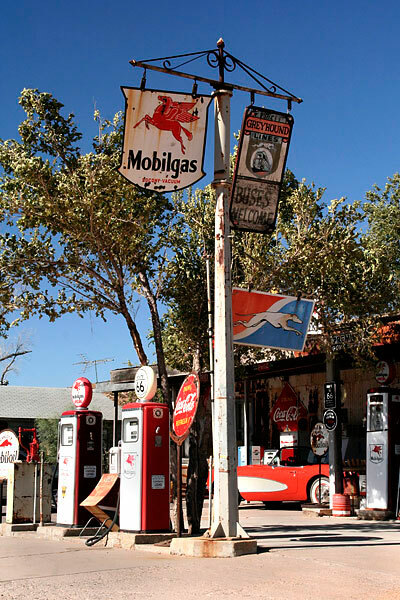 Sets of 'Berma Shave' advertising boards were once a common site on Route 66 verges, advertising men's shaving products. A few replicas are in place along this stretch of highway. 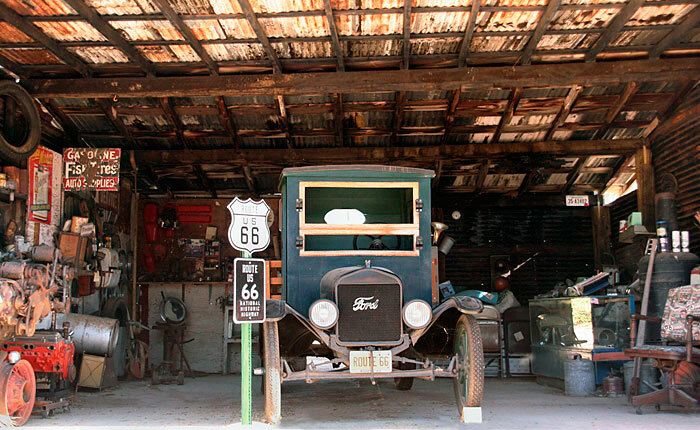 A recreated workshop around the back houses a Ford Model T surrounded by a dense accumulation of parts, tools and equipment. This Ford is of later vintage, and a fine 1956 Chevrolet Corvette stands in pride of place under the storefront veranda. The "300 MILES DESERT AHEAD" refers to the conditions across Western Arizona and the Mojave Desert in Southern California. 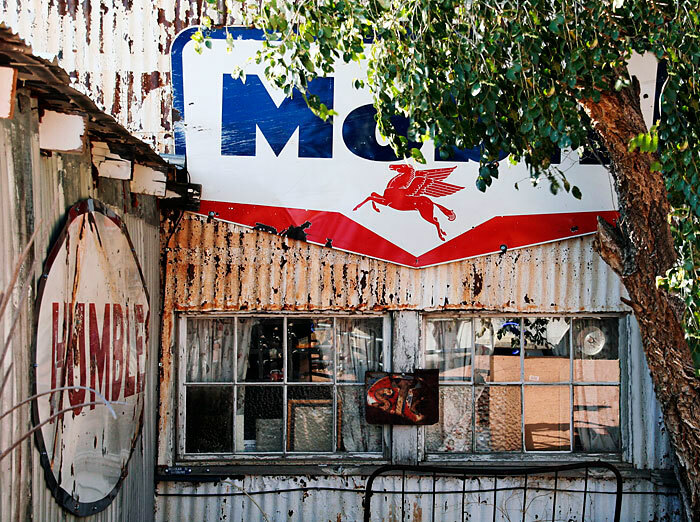 The Store is liberally decorated with all manner of metal signs in all states of repair. 'Clabber Girl Baking Powder' is still manufactured and is advertised on the Internet. Lt. Edward Beale surveyed a wagon route through Kingman in 1857. 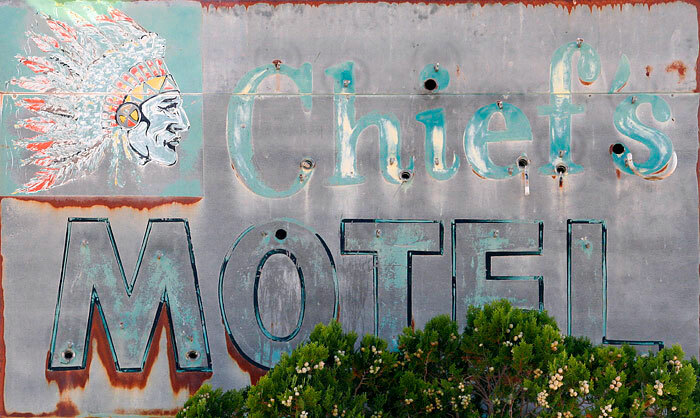 His namesake hotel, built alongside the Aitchison, Topeka & Santa Fe Railroad around 1900, stands deserted. Lewis Kingman was the railroad surveyor and in 1882 he used his name for the depot and the developing town. This mural is on the corrugated iron gable of an old wood framed store sandwiched between the railroad tracks and Route 66. 'Mother Road' was a description used by John Steinbeck in 'Grapes of Wrath'. The dealership is now housed in a new building elsewhere in Kingman. 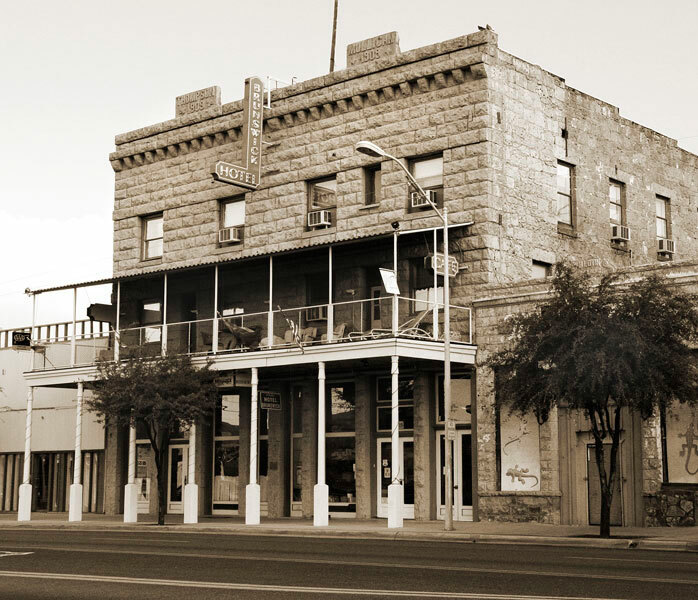 Built in 1909 by partners Mulligan and Thompson, the Brunswick Hotel was divided when the two men quarrelled in 1912. Rejoined in the sixties, the Hotel retains many original features. We were given earplugs to counter the twenty-four hour music of passing multi-engine freight trains. Old sepia photographs hung in the Brunswick prompted the same treatment here.